OSCE chairman-in-office Ilkka Kanerva visited Transdniestria on Thursday for official talks with the unrecognized country's government. In Tiraspol, he met with President Igor Smirnov, Foreign Minister Valeri Litskai, and leading members of Parliament. He urged all sides to resume direct talks over Transdniestria's future. During a visit Thursday to Tiraspol, the capital of Transdniestria, the head of the Organisation for Security and Co-operation in Europe (OSCE) called on Moldova and Transdniestria to resume status settlement talks over the disputed territory and welcomed signs that both sides were willing to discuss the free movement of goods, services and people across the Dniester river.
" - The OSCE has been working intensively with the chief negotiators to restart the 5+2 negotiations," the OSCE chairman-in-office, Finnish Foreign Minister Ilkka Kanerva, said in a prepared statement published on the organization's website. The 5+2 negotiations bring together Russia, Ukraine and the OSCE as mediators, together with the European Union and United States as observers, with the two parties represented by the Transdniestrian and the Moldovan governments. As OSCE's 2008 chairman-in-office, Ilkka Kanerva visited Tiraspol on Thursday where he met with President Igor Smirnov, Foreign Minister Valeri Litskai and key opposition leader Yevgeny Shevchuk, the current Speaker of Parliament. This was the second visit in less than six months of the top OSCE official, with former chairman-in-office Miguel Angel Moratinos having visited the Transdniestrian capital in October 2007. Transdniestria, officially named Pridnestrovie according to its constitution and local customs, declared independence in 1990, one year before Moldova. It has a non-Moldovan majority and it has never been part of Moldova or Romania at any time in the history of any of these two countries. During his visit to the capital of Transdniestria (Pridnestrovie) on Thursday, Ilkka Kanerva welcomed recent signs that Moldova and Transdniestria "were open to a good-faith dialogue on practical issues such as restrictions on freedom of movement and the interruption of communications links." " - This would be an important first step, and people on both sides would profit if solutions for these practical matters were found," Kanerva said. "Furthermore, engagement can help build trust and assist us in achieving progress on the status question," he added.
" - To me it was pleasant to arrive in Transdniestria and become acquainted with the situation here and with your opinions. Today, the Transdniestrian side has expressed its own point of view very clearly. During this trip I visited Ukraine, Moldova, and now I arrived here with you," said Kanerva.
" - We agreed that we should again attempt to negotiate. Not in a way whereby OSCE issues orders, but rather our intentions are to act as a servant and facilitate the process. We will actively contribute to status settlement talks," said Kanerva. "I am certain that Transdniestria finds itself in the hands of a strong leader," he also added after the meeting with elected President Igor Smirnov and his team. The OSCE's chairman-in-office also noted the willingness of both sides to resolve the conflict, although local newsman Roman Konoplev points out that this is not as straightforward as it sounds.
" - The key problem is that the words 'solving the conflict' means different things to either side. As far as Moldova is concerned, the 'solution' must be the one that its own government imposes," explains Konoplev. "Whereas Transdniestria thinks that any solution has to respect the will of the people, and that the final outcome must be based on the results of free and fair elections." Direct talks between Moldova and Transdniestria started at the beginning of 1993, after Moldova failed to conquer the territory in a series of military attacks in 1992. The talks resulted in a number of signed agreements by the sides, which Moldova has largely failed to abide by. 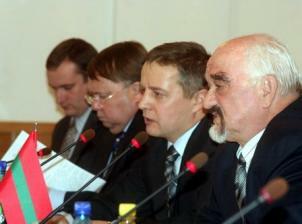 Moldova unilaterally left the talks at the end of February 2006, offering no explanation.